So this #SundaySupper we are celebrating back to school and my Miss J happens to love this dish. So in honor of Miss J starting school on Tuesday I thought this would be the perfect dish to serve. It's quick, (less then 20 minutes including the mashed potatoes) and easy and it looks fancy but it's not! The other night I was at the grocery store and I noticed the organic lamb chops were on sale so I quickly grabbed a couple and brought them home for dinner. I love Lamb chops however they are a huge treat in our house because they cost so much! So I quickly seasoned them with salt and pepper. Then I pulled out my frying pan and decided to sear them with some marinated artichoke hearts. They were simply divine. Cut Lamb chops apart then season with salt and pepper. Heat a frying pan with oil add chops and Artichoke hearts. Turn when golden brown these cook quick so only a minute or two depending how you like them cooked. Just take a look at our awesome line up of recipes coming this Sunday. These do look delicious! Lamb is a rare treat for us, as well - what a strike of luck that you found them on sale! This looks terribly sophisticated, and it´s so fast and easy! Wonderful idea. Have a nice sunday! I'm not a huge lamb fan, but love the idea of pairing it with artichokes. If I can find lamb chops around here, I'll give this a try! You sure did make this quick meal look fancy! Love the plating! I love finding meats on sale! This looks so good! For whatever reason I never think of lamb for a weeknight meal. You have just inspired me to do so when I find it on sale. I love lamb. I've never made lamb chops before but I'm working my way up to them. Yours looks really simple so I'm going to give them a try! Lamb IS such a treat--can't wait to give this a try! I had no idea that making lamb could be a 30 minute meal, but you prove that it totally can be! Great plating too. Thanks Sheila! Mmmmm. I absolutely LOVE lamb chops, and these look amazing! Love, love, LOVE lamb!!! I typically save it for special occasions, but why not during the week, too?! Mmmm...this sounds fantastic. I love lamb as a treat...and fortunately, so do the kiddos. Would love to try this! This is a fancy weeknight meal and it's so simple. Thanks for sharing! omg I'm all over the artichoke harts. I myself am not a lamb lover. I am the Goat sign in the Chinese calendar and it would be like eating myself. lol but I would subsitute the lamb with any other kind of protein. I love lamb but always only make it for a special occasion. I need to make some on a weeknight!! I'm not a big fan of lamb, but the artichokes look yummy... the lamb does too, just not my taste. Lamb, lamb, lamb! We love lamb in this house, it is a very English thing I know. I love that you paired with with artichoke hearts. This is a must try. Sounds super fast and easy! 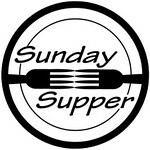 Hi fellow #SundaySupper friend! I don't eat lamb but the Husband does - he'd love this! Great simple recipe that looks quick and easy. I'll just have to make him cook his own dinner if he wants to eat lamb ;) I'd gladly devour the mashed potato though. That counts as a meal, right?